Back in the early 2000s, during the heyday of Generation X adolescent years, MTV and Johnny Knoxville presented the television series known as Jackass to the world. The show, which premiered back October of 2002 (and ran for three seasons until it was axed in 2002), showcased the wild and stupidly behavior of several stars, including Johnny Knoxville, Bam Magera Chris Pontius, Steve-O, Ryan Dunn and many others, as they perform various dangerous, self-injuring stunts and pranks throughout a half-hour time slot. While the TV series was deemed a success by MTV and was able to speak to the somewhat dejected and rebellious adolescent teenagers of the time, Jackass did spark a lot of controversy with the media and with concern parents, fearing that the group’s crude stunts and crazy pranks would incite (almost encourage) their dangerous behavior. On the other side of the spectrum, the Jackass TV show did spark similar shows that followed after it left the air, including Wildboyz, Viva La Bam, Homewrecker, and Dr. Steve-O as well as three theatrical feature films (i.e. Jackass: The Movie in 2002, Jackass Number Two in 2006, and Jackass 3-D in 2010). Additionally, Knoxville, Jackass’s main star from the beginning, garnished a minor iconic status, appearing on several feature films, including Walking Tall, The Dukes of Hazzard, Men in Black II, and The Ringer. In 2013, Knoxville returned to his Jackass roots for Bad Grandpa (or Jackass Presents: Bad Grandpa), a somewhat loose narrative that connects the stunts and pranks together within a story. Much like the other Jackass films, Bad Grandpa faced mixed review from fans and critics, but did received a modest return at the box office, collecting $150 million against its $15 million production budget. Now, roughly five years since Bad Grandpa was released, Johnny Knoxville along with Paramount Pictures presents the comedy film Action Point. Does this movie find its Jackass roots with today’s modern audience of moviegoers or is it a failed project that speaks to generation that has already grown-up? 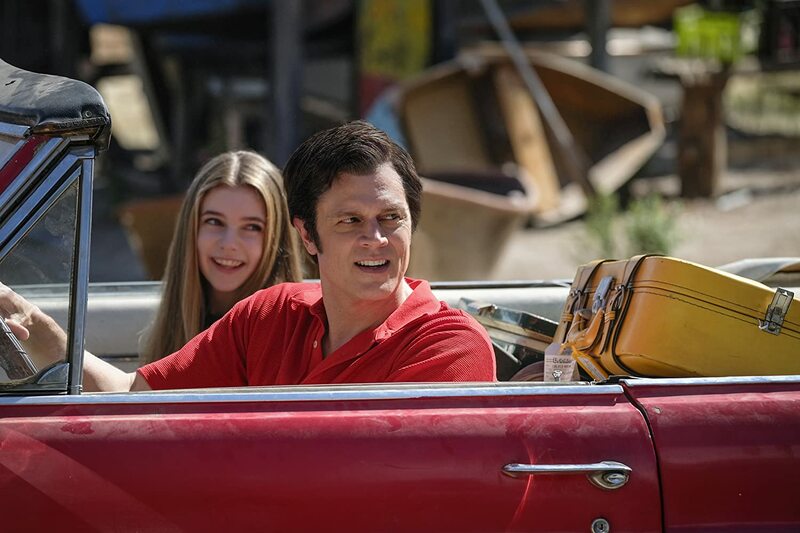 Happy to take care of his granddaughter for an afternoon, Deshawn Crious (aka D.C) (Johnny Knoxville), decides to pass the time in telling the girl with stories of his past, especially during the heyday of Action Point; an amusement park he once rain back during the 1970s. Set during a time when safety standards were laxed and things were more carefree, D.C. gives Action Point a chance to keep costs low and excitement level high with his collection of lakeside rides. Arriving on the scene during the summer of ’79, D.C.’s daughter Boogie (Eleanor Worthington-Cox) is ready to help out at the park, which is home to a collection of delinquent misfits, including her Uncle Benny (Chris Pontius), as well as spending some time with her dad. Unfortunately, trouble soon arrives on D.C.’s doorstep as a massive $100k bank loan is owed in keeping Action Point up and during, with land developer Knoblach (Dak Bakkedahl), who wants to collect Action Point and turn it into a luxury resort. Struggling to compete with the rival amusement park (i.e. 7 Parks), dealing with money issues, maintaining and updating the rides, and trying to be a proper parent to Boogie, D.C. has a hard time balancing all these responsibilities, facing the loss of everything he owns and loves. Being a part of Generation X, I do remember when MTV’s Jackass was initially released. I was in high school during that time and I do recall a lot of my fellow students talking about that show. Of course, I did watch it as well and do remember a few stunts that I liked and laughed at repeatedly during each of the episodes. I also remember all the controversy that media was placing on Jackass, fearing that other adolescent kids would try to “copycat” all these crazy stunts and pranks that Knoxville and his gang would do. Still, Jackass was something “unique” (especially for being an MTV show) and did reach a cult-status on TV as (speaking to the hearts and minds of the rebellious Gen X’s youths that didn’t want to grow up and / or hated the adulthood establishment. As for the movies, to me personally, I always felt that they were same. I do remember seeing Jackass: The Movie and Jackass Number Two (when it appeared on Comedy Central a few years after its released) and did find humor in them, but Jackass 3-D I just skipped over that one. I do remember when Bad Grandpa came out (recalling the previews for the movie), but I decided to skip as I was sort of “moved on” from all that early 2000s Jackass stunts / pranks and just found it to be stupid and dated. This brings me back to the topic at hand, which is in reviewing the movie Action Point. To be quite honest, I really didn’t hear much buzz at the movie online and only heard about the film when the film’s trailer debuted a few months prior to its release. However, judging by the trailer, I had a feeling that this movie was gonna be just adequate at best and maybe something a bit lower at its worst. To me, it just looked like it was gonna be another opportunity for Johnny Knoxville to play up his “jackass” routine. Still, I’m always looking for a “good laugh” and went to see this movie, hoping I would get that while watching this feature. So, what did I think of the movie? Well, while my expectations for this movie were low, Action Point still seem to fall flat on its face, producing a very weak comedy endeavor that’s just as pointless and stupid as one could imagine. I know that Knoxville and company were looking for gold when crafting this movie, but the end result leaves a wildly hallow and uninspiring comedy. Action Point is directed by Tim Kirkby, whose previous directorial works include Brockmire, Fleabag, and Look Around You. Right from the get-go, Kirkby sets the stage in making Action Point what you would expect it to be; a wild and stunt crazy motion picture that tries to emulate the same laughs and gags one would expect to find in Knoxville’s Jackass endeavors (both the tv show and its movies) as well as Bad Grandpa. I mean, D.C.’s Action Point amusement park (where no rules or safety restrictions are a concerned) is loosely based on an actual theme park that existed. Thus, it comes at no surprise that the guys behind Jackass would want to try to tackle a story that surrounds that idea. To its effect, the movie semi-captures that idea, using that main story thread to generate a plethora of crazy / dangerous stunts that are slightly creative in seeing how they come together. It’s mildly amusing at some points, which was probably one of the film’s small positive remarks. Additionally, given the movie’s premise, Action Point is very much a slapstick comedy endeavor, with many of its jokes and gags that are presented in a very physical foundation. Its not the most ingenious way of generating laughs, but Action Point does gets its points across when trying to display some raunchy humor, innuendo jokes, and dangerous stunt tricks. There are a few amusing parts that I felt were worth a chuckle or two (one in particular was D.C. creating a “kiddie zone” in Action Point for all the rambunctious kids out there. 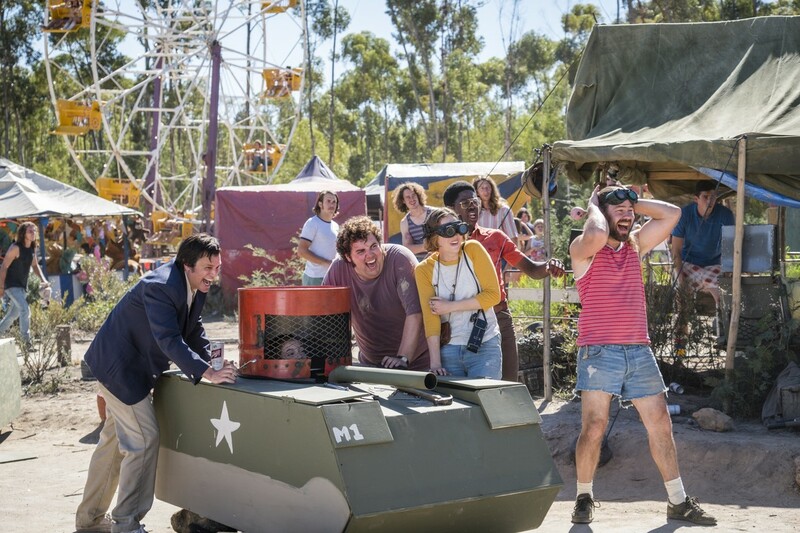 Basically, if you’re a fan of Jackass, Action Point certainly follows that chaotic haphazard plight of tricks and stunts. In terms of technical presentation, Action Point is a standard solid piece of filmmaking aspects. What I mean is that this movie won’t win any type of awards and / or nominations for its camera angles, cinematography, film editing, or set decorations. That being said, the movie’s overall presentation meets the industry standard for a 2018 comedy feature endeavor. Basically, I really don’t critique that much on the technical aspects and nuances of a movie like this. Still, Action Point, despite its many flaws (more on that below), looks and is overall well-presented (technically) as a comedy film in today’s movie world. In short, its neither really good nor really bad. It’s just a standard and I really can’t negatively cite the film for being deplorable in those categories. Unfortunately, Action Point doesn’t really reach for cinematic greatness and falls very much to the ground. In a nutshell, the movie just never real comes together, never finding its stride, place, or thematic / cinematic tone within the film’s story. Now, I knew that this movie was never gonna be something great, but Action Point even fails to find its place on just an adequate / mediocre level of motion picture entertainment. Where to begin? Well, for starters, the movie doesn’t really have a strong (or even a mild) story foundation to stand out. Yes, the movie’s premise of a wild and dangerous theme park with no rules sounds really good on paper and has that amusing interests to be put to the test as a cinematic endeavor. That being said, Action Point can’t translate that idea from page to screen, lacking a general fun and theatrical entertainment value to its name. The film’s script, which was penned by John Altschuler and Dave Krinsky, and with the story by Johnny Knoxville, Derek Freda, and Mike Judge (as well as Altschuler and Krinsky), is apparently clear that the film’s plot (despite its laughable idea on paper) is inherently flimsy. The plot, while having some moments of levity, feels vague and generic with plenty of plot hole and formulaic routines that many can see miles ahead (before even the characters come to that particular revelations. Perhaps with so many people “in the kitchen” (as the saying goes) that the idea for a somewhat cohesive narrative just falls flat, getting lost within its ideas of trying to regenerate some Jackass laughs. Speaking of that, the movie spends too much on time on its crazy stunts that trying to center around a strong narrative. Basically, I felt like I was literally watching an elongated lost episode from the Jackass tv show. Meaning that Action Point is, for tense and purpose, is a chance for Knoxville and gang to return to their “glory days” of Jackass. However, its mostly a backfire on their parts. Perhaps if Action Point was released during the heyday of Jackass (circa early 2000s era), the movie could’ve found a solid fanbase in making this movie worthwhile. Unfortunately, those Jackass days are long and gone, rendering the film in a somewhat moot point in its undertaking and throughout its proceedings. The goofy and dangerous stunts are the film’s main attraction, which makes the rest of Action Point, pointless and rather dull. Additionally, the film’s comedy, while initially fun due to physical / slapstick iterations, is mostly unfunny and uncreative. I mean, I love a good slapstick comedy, but the film’s humor base just felt so incredibly sluggish, dry, and almost outdated that I only chuckled a one or two moments in the movie. Thus, for a comedy film that’s not funny…that’s a huge negative black mark (at least in my film review book). The movie’s screenplay also tries to find heart within its narrative, speaking to a father / daughter relationship between characters D.C. and Boggie. Unfortunately, while the point does get across, the message just never materializes and never really gels with the rest of the film. Thus, the movie’s heartfelt drama piece seems half-baked and almost seems “out of place” within a such a hodgepodge and haphazard feature of a “no safety” amusement park. More to the point, much of the story never works, with too many characters and too many untethered ideas to make Action Point flow correctly. Even with a runtime 85 minutes long (even shorter than the standard runtime for an animated feature), most of the film just feels too loose in its execution and storytelling. There’s some drama portions here and there, but Kirkby and Knoxville never relies to the challenge. This means that Action Point never really aims for the stars nor even for a level of mediocrity, settling for cheap laughs that don’t last and are completely stale. The cast in Action Point is very much like its group of misfits rejects that come and populate this overall dangerous amusement park. Again, I never really expected them to shine incredibly bright within the context of the movie, but these individuals (both acting and / or characters) are just as bland and cookie cutter-ish as one would expect from such a shallow feature. At the head of the pack is actor Johnny Knoxville, who plays the film’s central character D.C. Knoxville, mostly known for his stunt on Jackass as well as Walking Tall and The Dukes of Hazzard, has probably the most acting talents of the entire film cast and he has that stage presence whenever he’s on-screen as the lead title character. Unfortunately, most of his talents (if that at all) are completely wasted throughout Action Point. Maybe Knoxville is partly to blame or maybe it has to be the film’s script, but the character of D.C. is completely bland and lacks substance beyond being the owner of the Action Point theme park. Knoxville really doesn’t invest a lot into the movie (beyond his standard stunts and goofy humor), but he even so, he just seems so vanilla and uninteresting that it makes D.C. unappealing, even for the central character of the feature. To even add more insult to injury (yes, I made a pun), Knoxville is getting up there in age and doesn’t seem that much into the more dangerous stunts as he used to. 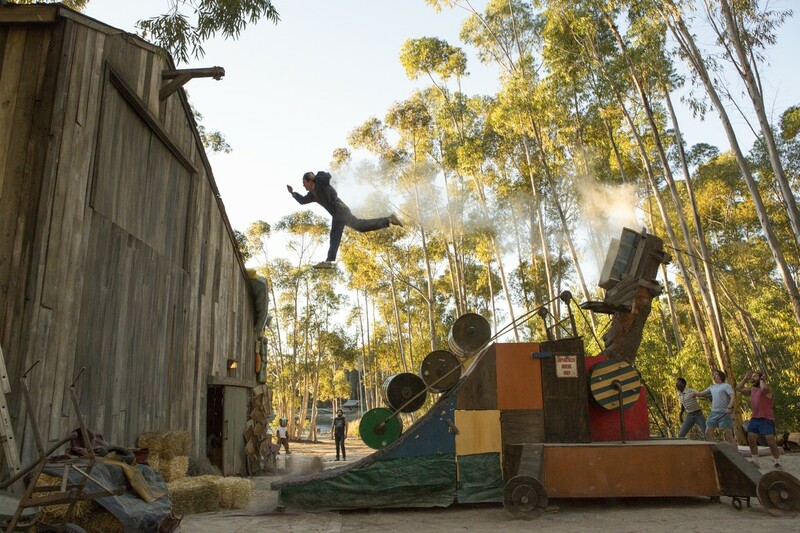 So, even though Knoxville is up to the task for some stunt work in Action Point, the truth is that most of his crazy stunts in the movie aren’t as what they used to be. There are a few moments in the movie where a viewer can actually see a genuine terror and panic on his face and those are the ones that actually come across as genuine. The rest, however, it’s just mild and recycled-ish ideas. Beyond Knoxville, the only really character that truly does shine (and is probably the most memorable one of the feature) is actress Eleanor Worthington-Cox, who plays the younger version of Boggie. Known for her roles in Maleficent, Cucumber, and Britannia, Worthington-Cox seems to have the better acting talents (more so than Knoxville), acting as the somewhat “voice of reason” for the feature (and for D.C. ragtag crew of misfits). Personally, I liked her character the most in Action Point, with her character of Boogie being the most well-rounded and developed by far. Although, the father / daughter relationship dynamic between her and Knoxville’s D.C. doesn’t really come to fruition (by the time the movie ends), she makes Boggie the most interesting and possibly mature one of the entire one on-screen (probably in both character as well as actress). Beyond those two character, the more supporting ones consist of Knoxville’s Jackass co-star Chris Pontius as Benny (who is a close friend to D.C. and acts as Boggie’s uncle) and actor Dan Bakkedahl (Veep and The Heat) who plays Knoblach (the man who wants Action Point to fail, so he could seize the land and build a resort in its place). Of the two, Bakkedahl seems to be better one (acting-wise) and does play the film’s central bad guy with his chew / cheesy dialogue (something befitting for this comedy movie). It’s not much, but his portrayal of Knoblach is okay, even though the character isn’t that really creative or engaging. Pontius, on the other hand, doesn’t really seem to “acting” and just seems to “along for the ride” throughout most of Action Point. To be honest, I don’t think he knew that the camera was rolling and just being himself. Sometimes that’s a good thing, sometimes it’s a bad thing. He’s just being himself. However, his humorous bits aren’t exactly gold material and just comes across as awkward / goofy, which makes me more lean towards the negative side of his character. Additionally, actor Matthew Peterson (Toska) plays Knoblach’s son Travis, but his character is so annoying and thinly written that he just comes off as being underdeveloped and completely unnecessary throughout his screen-time on the film. The rest of the cast of characters in the movie are mostly filler characters, filling in certain scenes and background moments throughout the feature. This includes actor Eric Manaka (who makes his acting debut in Action Point) as Rodney, actress Brigette Lundy-Paine (The Glass Castle and Atypical) as four finger Anne, actor Johnny Pemberton (21 Jump Street and In the Loop) as Ziffel, actor Joshua Hoover (The Walking Dead and Halt and Catch Fire) as Hot-Headed Pete, actor Conner McVicker (And Then I Go and Vice Principals) as Stiv, and actress Susan Yeagley (Almost Famous and Parks and Recreation) as the older (i.e. Adult) Boogie. These characters, for the most part, embrace their quirkiness of their individual characters, but (again) these characters are just “shells” and not really developed beyond what the movie first presents them to be. To be honest, most of these characters are just goofy stereotypes (i.e. the geeky nerd, the goofy one, the angry one, etc.) and are just collectively put together for the sake of a ragtag bunch of brainless delinquents. The saying “No rules, no safety…. just pure action fun” is the mantra tagline for the comedy movie Action Point. Director Tim Kirkby latest film sees the return of Knoxville’s Jackass acts of goofy and dangerous stunts for a new generation of viewers, presenting a unique story of amusement park with no safety rules and regulations. While its premise has a funny setup for a movie, the film itself just never takes shape and feels too vague and unappealing to even warrant a full-length feature film. Additionally, the cast (beyond Worthington-Cox’s performance) is mostly bland, the plot is formulaic and thinly-written, and the film’s comedy just lacks all substance. To me, this movie was just fallout bad in almost all aspects. It was pointless, hallows, uninspiring, formulaic, and just downright unfunny. Thus, and it goes with saying, that I would give this movie a hard “skip it” as the film doesn’t really offer much in the way of entertainment value (be it heartfelt and / or slapstick) in any way. Fans of Knoxville’s Jackass might find a special attraction to this film, but even they to should stay away from this movie and just simply watch one of the old Jackass episodes (they’ll probably get more laughs in them than this bland feature film). In the end, while many comedy film endeavors shoot for comedic gold (trying to find a balance between story and laughs), Action Point just never gets its feet off the work, crashing (and burning) into a hodgepodge mess of crazy, dangerous stunts and nothing more. Simple answer, Action Point is flat-out boring and stupid.